Roses have been branded as fussy and demanding primadonnas, but in here in Utah, that is just not the case. This is part II, a continuation of “Got Roses?” posted a few weeks ago. I mentioned that roses grow quite happily in our Utah climate. The purpose of this is not to change the minds of those who just don’t like roses, but to reassure people who have been afraid to try them, because they think roses are demanding. I’d like to go into further detail about my organic methods of caring for roses. Roses are not bothered much by diseases in Utah, so forget the fungicides and pesticides here. What roses do need in our dry climate is water and organic matter. Utah’s mineral soils are very low in organic matter and our skies low in precipitation with most of it falling in the winter. 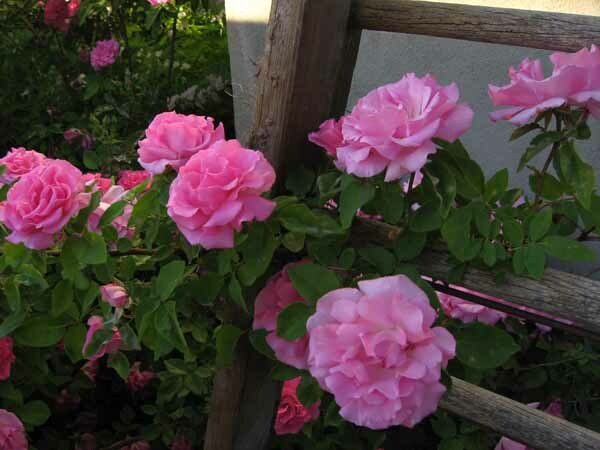 In this low rainfall climate, roses will need some supplemental water, however they are not so thirsty as lawns. Roses are quite drought tolerant actually. I’m sure those rose rustlers, who preserve roses by cuttings of found roses on abandoned homesteads and cemeteries would agree. If we get good spring rains here, you can get by without applying supplemental water for quite a while. Now here’s a piece of advice that applies to all gardening. Don’t run your irrigation on a set schedule. It’s a good idea to arrange the plantings by water needs and then only water each zone of the garden as needed. The soils in the Salt Lake area as varying just as the hardiness zones. In the valley you find more clayey soils, while the foothills can be very sandy. Organic matter can help both. It will help break up the clay, and help the sandy soils retain moisture. High elevations may be a zone colder than the valleys, so it’s important to make sure you choose roses that are hardy where you live. I mix some compost in the planting hole with a ratio of 1/3 compost to 2/3 native soil. If when you dig you hit hardpan clay, you will want to break up as much of that as you can. If you have really bad drainage raised beds can help. To fertilize my roses, I use alfalfa pellets, purchased from the feed store in 50 lb. bags for about 8 bucks. 50 lb of alfalfa will feed a lot of roses. Here you can get them from IFA or Steve Regan co. Alfalfa is a balanced fertilizer with a NPK ratio of 3-1-2. I soak them in a bucket for a while when I’m working in the yard, just to soften the pellets. Then I put maybe 2-3 cups, using the shovel around the base of each established rose. You would use less on smaller or young roses. Then hubby follows me and pours compost to cover the pellets. I do it this way because my dog likes the pellets and will try to eat them dry. If you don’t have those concerns, you could run around the yard flinging pellets dancing as you go. Also another great amendment here is cottonseed meal. It has a higher nitrogen content than the alfalfa, but also is acidifying, which is helpful for our alkaline soils. Most roses that are budded onto rootstock in the U.S. are budded on to Dr. Huey which really does well in alkaline soils, but even my own root roses seem to adapt well. If you ever have a rose that was one color in previous years and suddenly is blooming red too, you want to remove those red suckers (Dr. Huey) down at the base of the rose where it is emerging. If you’re only seeing red blooms, the top of your rose(the budded desirable one) has probably died off. That’s why it’s important to choose hardy roses. You can also bury the bud union deep at planting to keep it protected from the cold. 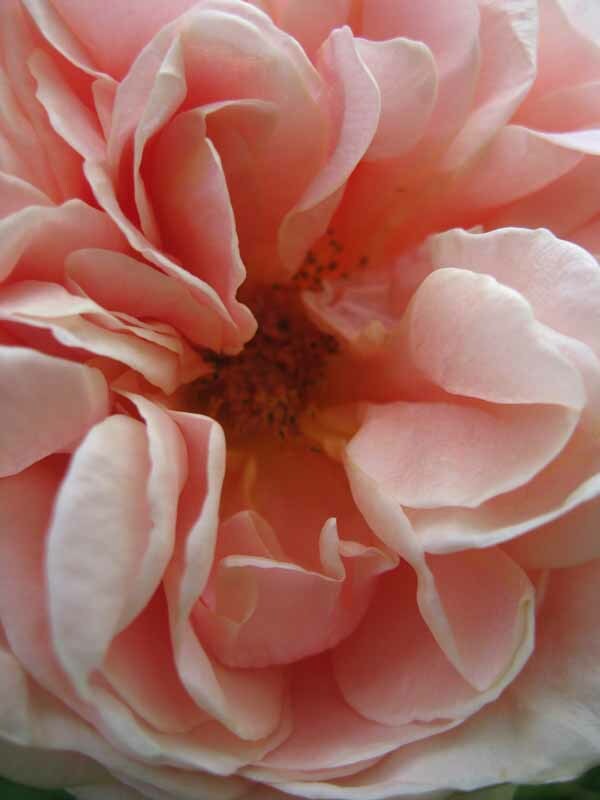 You can also give your roses an extra oomph occasionally by giving them an organic fertilizer like Dr. Earth. There are other brands too. Don’t overdo this though, even organic fertilizers can burn if misapplied. I should mention here that it is really important to get a soil test before you start adding lots of fertilizers to your soil. My soil test showed very high in both phosphorous and potassium, so I don’t need to be adding those, and too much can be detrimental. You can get a soil test from the USU county extension office. It’s well worth the $14 cost. Pruning is probably the biggest chore with roses. But if you have just say five, it’s not a big deal at all. When you have 80 roses, pruning begins to feel like work. Not because it’s hard to do, it’s just that there’s a lot of pruning to do in a small time frame. Don’t sweat the pruning. To paraphrase what Joy Bossi always says, “the person holding the pruners makes the rules.” I would say the main thing with pruning roses, is that as your roses mature, you want to remove some of the older canes each year allowing the young ones to rejuvenate it. If you are looking for information on how to prune, follow this link to Paul Zimmerman’s You Tube channel, where he has numerous excellent video demonstrations. 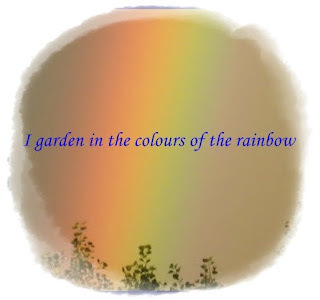 You can also visit his blog Roses are Plants Too. 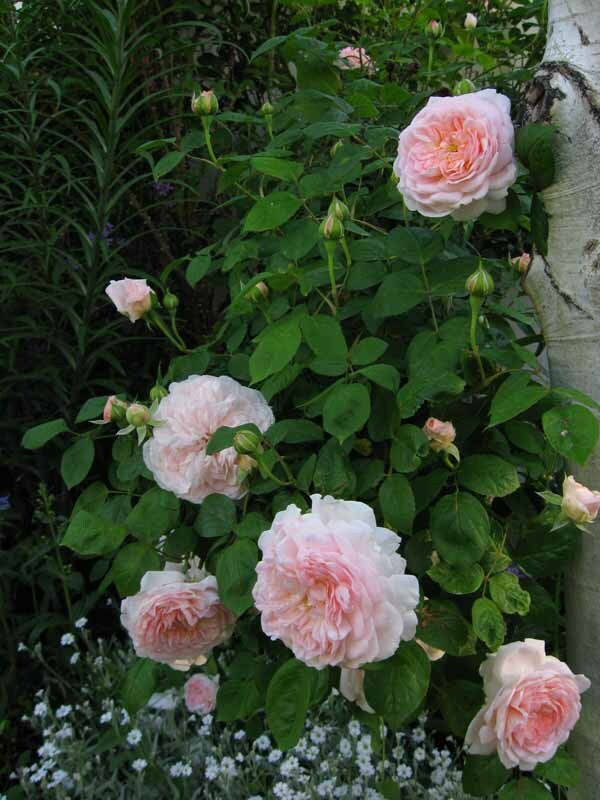 A great rose book is Foolproof Guide to Growing Roses by Field Roebuck. This book has been updated and released as Complete Roses:Featuring 100 Easy-Growing Favorites. You should be able to find it at the bookstore. 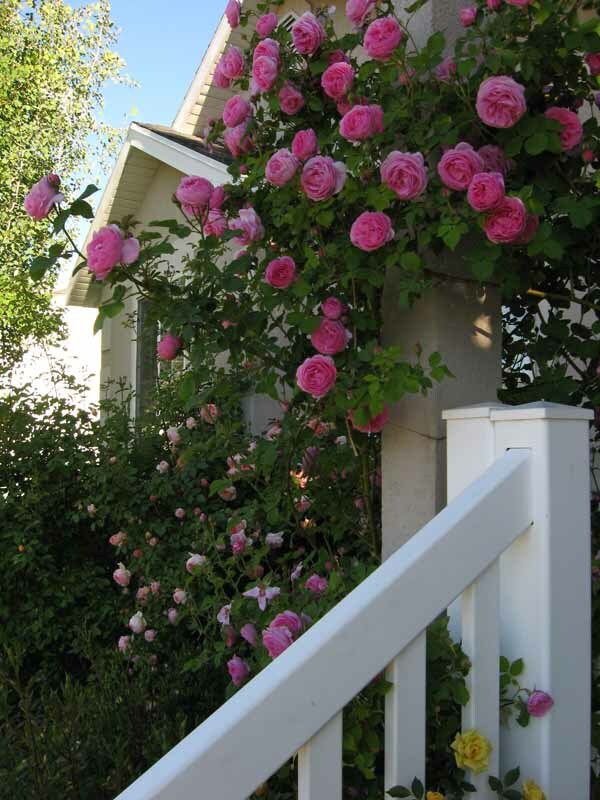 High Country Roses in Jensen Utah- They carry and can advise on hardy roses- own root. They also carry the roses native to Utah: Nootka Rose, rosa nutkana, and Wood’s Rose, rosa woodsii. For a great selection of roses locally, I recommend J&L Garden Center in Bountiful as one of the best for selection and value. 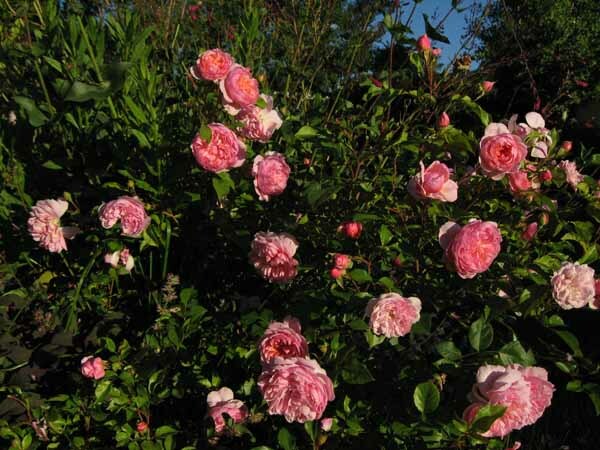 If you are looking for old garden roses, the local nurseries usually only have a couple of varieties if any. You may have to go mail order to have more of a selection. 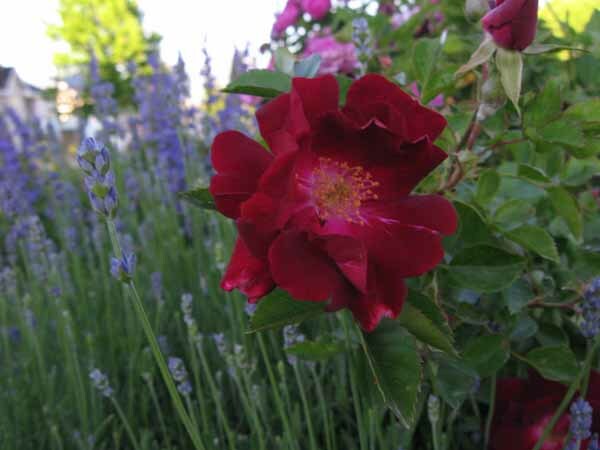 So why not try a beautiful rose in your landscape? If you’re only going to grow one or two make sure that you choose a fragrant rose, one that fills the air with heady fragrance. I love growing roses too! I am NOT into high-maintenance gardening and roses and I get along just fine. I do think our dry climate makes it much easier in regards to foliar diseases. My Graham Thomas and Abraham Darby roses are blooming right now. Your tips are very helpful and your roses are beautiful! I agree that the dry air helps. I have Graham and Abe too. A woman after my own heart! That’s Graham Thomas up in my header picture. We grow many roses beautifully here in Alaska, where I have not found them to be divas. Own-root are preferable for hardiness reasons, but the Explorer series is fabulous here as is most anything with R. rugosa in its breeding. R. glauca is very popular here as well. They are a must have in my garden because of the fragrance and the hips in fall/winter, to say nothing of the beautiful blossoms. That’s wonderful Christine. I have the explorer John Davis and it has it all, hips, red fall foliage, red stems and beautiful blooms. Glauca has a lot of wonderful qualities, I should probably be growing it. Some of the rugosas have really good fragrance too don’t they? Wow, you have so many beauties. 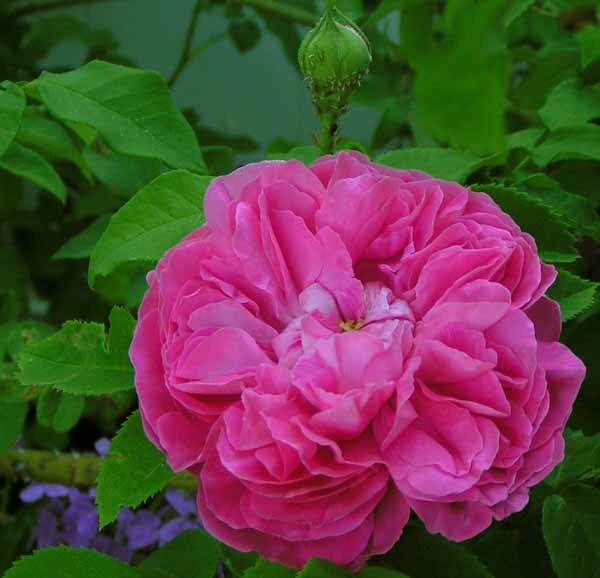 I have had Zephirine Drouhin on my list for a while and seeing yours just makes me want one more. Thanks Lona. Zephirine is not very heavy on the repeat but oh, she’s fragrant! I’m in Orem, and I agree with you on the ease of roses here. Although, I do have a couple of Austin roses, and I noticed they struggle a bit. The are both east facing, and get shaded by the house by 2:00, but my Gertrude Jekyll gets a bit more summer sun and doesn’t do as well. I think I’ll move it so it gets into the shade faster in the summer heat with the other, Queen of Sweden. The alfalfa pellets tip is excellent. I was going to just put down compost, but I’ll try that this year and see how it does. East facing is a good spot here. Roses do like the sun – do you mean that the blooms fade in the sun or that the rose bush is actually struggling? I have a couple of red roses whose blooms burn in too much sun. Thanks for spreading some great information and showing some great photos. I hope you appreciate how good you have it there in reference to roses. We fight an army of hungry insects and a host of diseases here. The high summer humidity and heat really force rose growers to be picky as to what to grow, either that or spray nasty things on them. Oh boy, I do know that we’re lucky here Les. 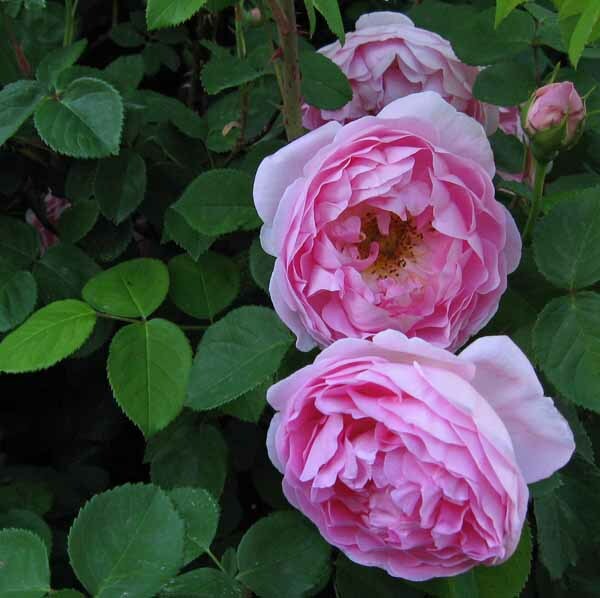 I know that in the humid areas rose choices become very important. So far no Japanese Beetles here- Knock on Wood! Roses are a bit more work here in central Ohio, but oh so worth it! My biggest problem is the Japanese beetles, I have to fight them valiently to keep them from winning. And my best fertilizer is the coffee grounds I pick up at Starbucks. My roses love them! Last year I had several of them reach 8 feet high, and those are NOT climbers! Be sure to plant more bulbs this fall, you won’t regret it.